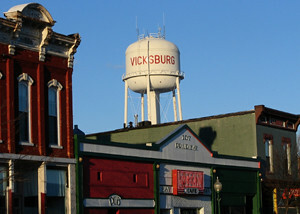 I recently found out the water tower in Vicksburg isn’t a water tower at all. In fact, it’s actually a beer tower. Through a series of underground tunnels and fiber optics all the beer needs of the community are met. This especially goes for the Lion’s Club who hold their annual picnic during July. What really packs the people in is their beer tent. That truly is something to behold. So I’m told. It’s usually the fire department’s job to make sure the beer pressure is at a high enough level to serve the multitudes that come to the picnic. Typically they test the night before. That to me is poor planning but I’m not the boss. A week before makes more sense. But, like I said I’m not the boss. Anyway the fire department routes the beer to all the fire hydrants then flushes them. They then measure the distance the beer travels to determine beer pressure. Pretty simple really. One year myself and a couple others volunteered to clear the drunken squirrels from around the village’s “beer” hydrants. Since squirrels can’t hold their liquor most were passed out close to the hydrants. All we had to do was scoop them up and stack them in the nearest trees. I think, and others would agree, the village looked good that year.